WAN-optimization startup Infineta (see disclosure) has raised $15 million in a Series B funding round for its product that speeds traffic flows between data centers and optimizes bandwidth utilization. The latest investment comes from Rembrandt Venture Partners, Alloy Ventures and North Bridge Venture Partners, and the company has now raised $30 million in two rounds. Unlike many WAN-optimization products that speed traffic between user sites and a data center, Infineta, based in San Jose, Calif., targets data moving between data centers and is capable of boosting performance across even 10 gigabit Ethernet networks. This is a particularly useful capability as organizations begin looking at building geographically distributed cloud-computing infrastructures and moving big data sets from one data center to another. The company’s flagship product — which also is generally available as of today — is called the Data Mobility Switch. It’s a hardware-based product that not only improves performance across wide-area networks but, Vice President of Corporate Marketing John Oh told me, also brings capacity gains between 5X and 10X. So, it’s like having fatter pipes without having to lay new fiber or invest in faster network ports. It does this via compression and deduplication algorithms that do to network traffic what those technologies already do for storage volumes: Infineta’s product ensures, at near-wire-line speeds, that the same data doesn’t cross the network twice. Its current limit is 10 gigabit Ethernet, but Oh said the company is targeting 20 gigabits in its next-generation appliance. Oh said the product is ideal for use cases such as disaster recovery and high availability, because users can begin to transition into truly active/active architectures in which data is replicating to the second site much faster than previously possible. This is especially great for building dynamic clouds in which applications can move seamlessly between geographically distributed sites and not be isolated to a single data center. As Infineta Vice President of Products Haseeb Budhani explained, products such as VMware’s VMotion, which enables the movement of live virtual machines between servers, require fast and consistent connections that often make moving VMs over the WAN an impossibility. However, he said, the company already has a large hosting customer doing this in a trial environment. The prospect of building private clouds in which applications can move between data centers as demand dictates is sure to be a big topic of conversation at our Structure 2011 conference in a couple of weeks, where speakers include leading executives from network giants such as Cisco Systems (s csco), Juniper Networks (s jnpr) and AT&T (s t), as well as up-and-coming vendors such as Arista Networks and Big Switch Networks. Budhani said Infineta’s technology is also proving especially adept for big data environments, which is something the company didn’t necessarily expect. I’ve explained before that big data creates demands not only on the processing components of the infrastructure but also on the network as companies try to move it between servers without experiencing a bottleneck in the process. Some organizations already have begun addressing this issue within the data center, but many consider running truly big data workflows across data centers a questionable proposition, because it just takes too long to move all that data across the Internet. Already, though, Infineta has a “major media company” customer moving 5TB log files between Hadoop and Cassandra clusters in Seattle and Mountain View, Calif., multiple times per day at less than six hours per trip. Previously, Budhani said, the customer wasn’t able to transport this data even once per day. Oh said Infineta presently has more than six large customers using the product on a trial basis, but he expects that number to grow now that the Data Mobility Switch product, which starts at $80,000, is generally available. If the product can live up to the company’s claims, it’s difficult to see anything but great things for Infineta, which is coming to market at an ideal time. 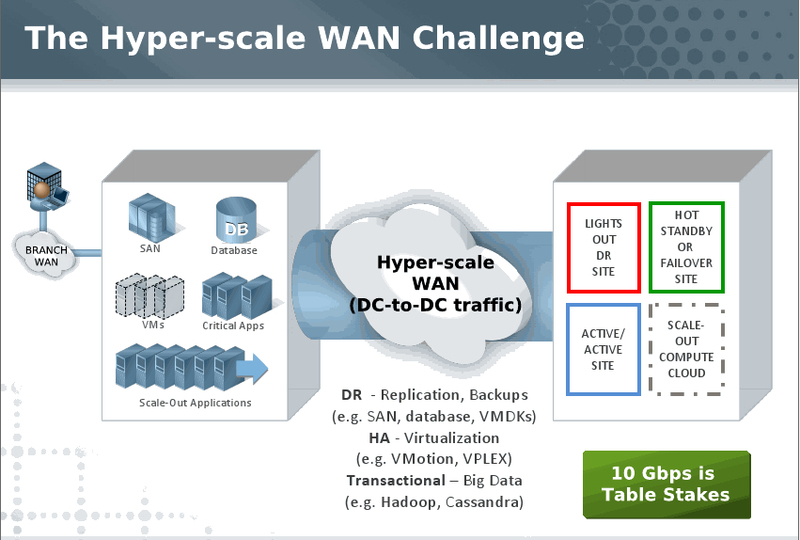 Cloud computing and big data both are creating new demands for network performance. Increasingly, the two technologies are actually merging as organizations look to maximize their distributed architectures. Any company that addresses both issues in a single product is sure to garner a few very interested looks. Disclosure: Infineta is backed by Alloy Ventures, which also backs GigaOmni Media, the parent company of this blog.